Why did we domesticate cats especially as they can trace there ancestor back down to Sabre tooth Tigers through to Lions and Panthers? Why should we have this little cousin of the bigger cats around? The simple answer is that cats provided us with an answer to pest control. They share similar physical shape character to the larger cat family and they apply the same moves too. If you study what a lion does that is exactly what a cat does when it is hunting. The only difference is that the domestic cat is probably after a rat rather than a Gazelle. Cats are carnivorous which is why they fancy a bird or vole now and again. When they bring it back and leave it for you, usually half eaten its actually a sign of love. They want to share their food with you as they recognise you as being the head of the pride. Its cold comfort though as they can leave a mess. My old cat decided to hide a dead mouse it had capture from a dry-stone wall. It stunk the room out for days. Thankfully this was only a very rare occurrence and generally he was happy with his chicken and beef cat food. 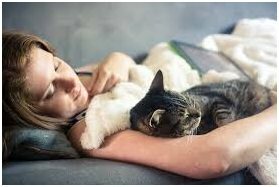 The real reason we have these furry friends around though is the pretty much unconditionally love that they give to us why not look at Cat Lap trays with both of you and your cat on. They are a welcome fluffy face when we come home. They seem to just know when we are down and come and snuggle up to us on the sofa. They will do something amusing like chase after one of their toys (getting practice for bringing in one of those voles again!) or try and climb up something that you know they shouldn’t, but they haven’t figured out that its dangerous yet. It’s certainly true about curiosity with cats as you spend ages trying to save them from the sticky situations they get themselves in. We have much to be grateful to them for.